This is the Friday space where I usually have my she read, she saw post. I know many of you enjoy it as I get so much feedback from it every week. We, the daughter and I, aren't sure how to re-work it now that she no longer lives out of state. We are tossing around a few ideas and promise to be quick about it. Until then, I thought you might enjoy this photo of Andrew Henry next to a giant Redwood tree. We were driving that moving truck from Grants Pass, Oregon over to the Pacific Coastline last week and all of a sudden, we were surrounded by massive Redwoods. I have a picture like this of Troy - only he was inside an opening of the tree - it was from our honeymoon in '96 - and it was outside San Fran - but the reaction I had to this picture was exactly the same - WOW! wow! 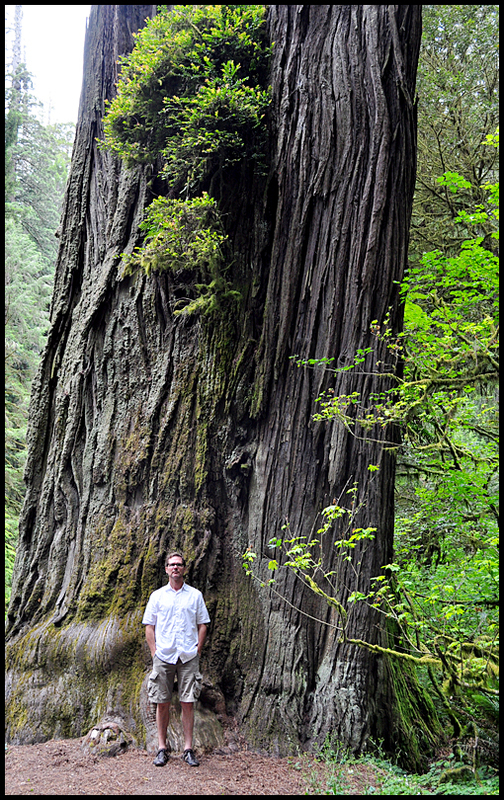 I have yet to see a redwood -- must do this! These trees are so very awesome. Congratulations on your daughters graduation. Where on earth did she graduate from??? WOW. That is a HUGE LESSON IN LIFE....we need to preserve our world because from mother earth do we eat....oh dear, what a great word for the day. THANK YOU FOR COMING TO see the colors of nature that came my way via Pinterest!!!! Love that pink parrot, don't you? These trees were absolutely amazing. It's hard to believe how big they are. I would love to see that for myself one of these days. Your picture is great but I imagine nothing can capture the beauty and size of the real thing! Happy weekend, guys! Great picture of the tree & your hubs! Fascinating! So happy your girl is home iwth you & wow what a shing dig you put on last year!...So fun! You are so sweet to pop over & visit...how is the hairdressing going! Even if you live in the same state you live different lives... Have a nice one! thank you for your congratulations!!! Hey, how did the stain removing go? Those gorgeous, gorgeous trees, and what a great shot! Believe it or not, I recently discovered several large Redwood trees right here in Vienna. Hey girl, glad you are enjoying your blog break. Big beach day for me tomorrow... I am set with new pedi and new bikini ;) Cannot see link in your recent post, nor can I post a comment on that thread. How magnificent it is to see such ancient things. Sure does gives one some perspective.